The overall goal of feed bunk management is to maintain consistency within the feeding system. Photo courtesy of Troy Walz. Proper bunk management is the art of matching feed deliveries to the amount of feed cattle need for optimal performance. Underfeeding cattle results in poor gains and feed efficiency, longer days on feed, and reduced carcass quality. On the other hand, putting more feed in front of cattle than they can handle leads to digestive upsets, crashes in intake, and wasted feed (Pritchard et al., 2003). 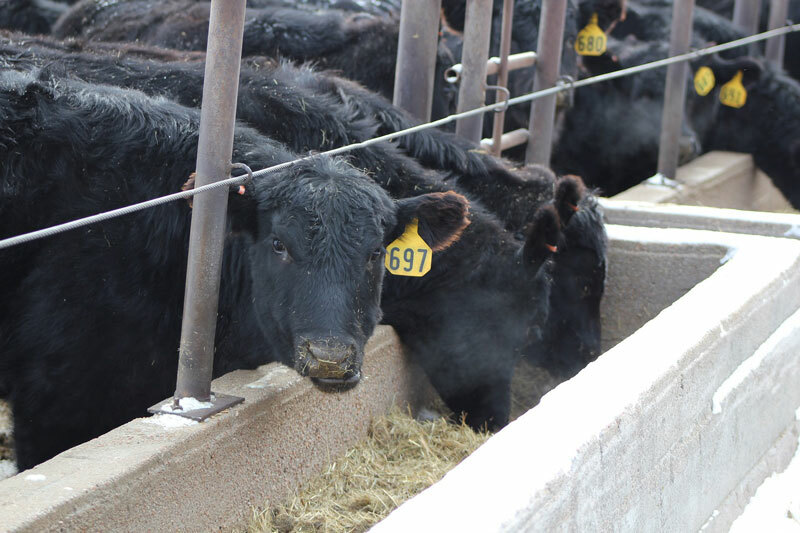 Considering an improvement of 0.1 pound in feed to gain (F/G) is worth $10 per head at the feedlot, proper bunk management should not be overlooked. The overall goal of feed bunk management is to maintain consistency within the feeding system. This means delivering the right diet in the right amount at the right time. Maintaining diet quality begins with periodic sampling and analyses of feedstuffs. Feed batches should be adjusted for changes in moisture content of ingredients to ensure cattle are eating the same diet that was formulated. It is important to accurately weigh feed and establish a uniform mix. In regards to timing, feed should be delivered within 15 minutes of the same time each day (Lundy et al., 2015). Minimizing variation in feed deliveries promotes stable ruminal fermentation, which ultimately improves feed efficiency and reduces production costs. When reading bunks and making feed calls, it is critical that the bunk reader or feed caller knows the cattle history. Bunk management records should include feed deliveries and bunk scores from at least the previous four days. Feed call decisions should also be based on cattle behavior/activity, stool appearance, and weather conditions. If today’s feed delivery is increased by 4% - 6% DM, wait three days before bumping the feed delivery again to see how the cattle handle the change in intake. Considering it can take two to three days for a mistake to show up in the system, good record keeping is essential to determining the cause of cattle off feed (Pritchard, 1993). Lundy, E.L., D., Loy, and G. Dahlke. 2015. Feed bunk management. Iowa Beef Center. Available: https://store.extension.iastate.edu/Product/Feed-Bunk-Management. Pritchard, R.H. 1993. Bunk management. Proceedings. Land O’Lakes. Delivering the Difference Conference. Available: http://gpvec.unl.edu/Elective_files/feedlot/BunkMgt_101_RP.pdf. Pritchard, R.H, and K.W. Bruns. 2003. Controlling variation in feed intake through bunk management. J. Anim. Sci. 81(E. Suppl. 2):E133-E138.